Steering systems have improved over the years, in respect of weight and range of motion. Modern track cars require little input, and rarely involve any movement of the hands other than "fixed grip." In prominent Single Seater leagues, the wheel has developed into a "cut out" form that is suitable for a fixed manner of gripping and turning the wheel. Nevertheless, during autcrossing, rallying or when driving down a tight track hairpin or even on the public road - different steering styles can be used and adopting an effective style would improve the driver's control. The method that we are about to demonstrate is considered an advanced one, and a classic manner of steering in rallying, as it has been practiced when rally cars had normal steering racks that required large inputs and constant steering to the left and right (due to the function of the suspension). It's significance is in the ability to maximize the steering amplitude for a given amount of hand motions, while providing maximum control and keeping the hands in the basic position for the longest time practically possible. It has been called in times "pull method" since it relies on the hand in the direction of the corner, and it is a refined manner of predictive steering. These distinctions will become clear through the read. The know term "Fixed Input Steering" refers to holding the wheel with both hands and simply turning it to either side with the hands in their position. This is the most basic manner of turning the wheel and it is the core and heart of the steering method we are about to introduce. 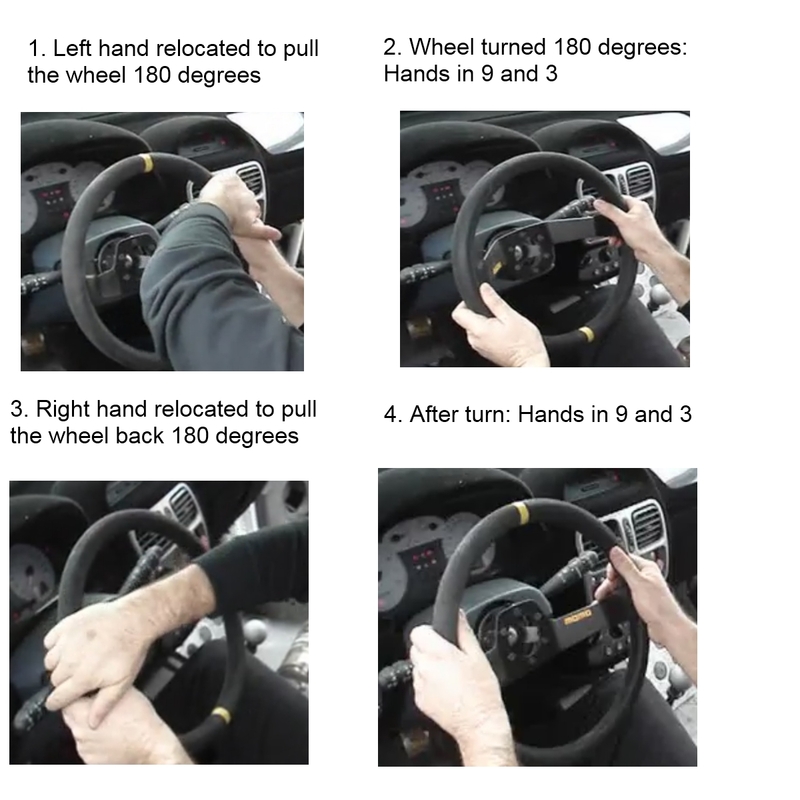 The ideal grip is at 9 and 3 on the wheel (9:15). Contrary to the popular grip at the top of the wheel (12O'Clock), or the customary 10 and 2 (ten to two) or 8 to 4 grip - this position creates the widest possible leverage between one arm and the other, and the biggest base possible relative to the vector of gravity. Have another person try to rock the steering wheel when you hold it. You will find that it is easier to resist this pull when holding the wheel at quarter to three than in any other position. The rims are normally suited for this position, so the spokes of the wheel and the shape of the rim for a "socket" for the thumbs. Also, by this position you can turn the wheel with "fixed input" to an overall amplitude of 260 degrees in each direction. For a modern steering rack this is an enormous amount of 'lock', for getting around curves or sudden obstructions. The ten to-two grip, as it has been widely practiced, is in origin a position that was used in older cars where the rims had a big diameter and the driving position was often less than desired. Under these conditions, the quarter to three grip would have normally resulted in the hands being extended too far to the sides, wider than the shoulders. The grip of the wheel would become awkward and the leverage and amplitude would have been restricted by the driver's body. A higher grip, on the other hand, allowed the driver to rest the weight of the arms over the rim and turn it with his upper body. Also, the wheels did not host an airbag that can nowadays injure the arms if placed too high, and the signals and wipers were extended upwards to match this kind of grip. When turning in 10 to-2, both hands sort of "collapse" into bends and cannot support each other. Place the palms so that they cup the outer diameter of the wheel, but slightly tilted downward so that the heel of the thumb is pressed against the face of the rim and the thumb can be lightly hooked inside the rim. The fingers should curl around the wheel and under the crossbrace. The grip should be light: Just tight enough to keep the wheel under control. This reduces stress and muscular tension, as well as reducing the stiffness of the forearms, allowing for greater feedback through the wheel. Your fingertips are your main sensory input, but that does not mean that your palms can't help. The tightness of the grip changes according to the surface: It should be tightened on bumpy surfaces and it's also recommended that you put the thumbs on the face of the rim in such conditions, since a serious obstacle could jerk the wheel as to break the thumb. Fixed Input steering is considered an efficient manner of steering for amplitudes of under 90 degrees (less than a quarter-turn of the wheel). It's important to maintain the light grip even while turning the wheel. Instead of tensing the arms, relax them and let the elbows drop down. Fixed input steering is especially relevant for long curves or ones with an opening radius or numerous clipping points. In Single-Seaters (like Formula 1) fixed input is used exclusively. For corners that require turning the wheel 90 degrees or more, it's better to use a more complex manner of turning the wheel. The idea is to steer predictively. Instead of gripping the wheel at quarter-to-three and than starting to turn the wheel, we see the bend in front, asses how tight it is and how much steering is requires, and than replace our hands off-set on purpose so that, after turning into the corner, the hands "fall back" into the basic position of quarter-to-three, and remain therein through the curve up to after the apex of the turn. Than we replace the hands again and turn the wheel back to straight. Some drivers achieve this by relocating both hands against the turn, and than turning "back" to straight. Our method is a more refined manner of doing this by relocating only the hand in the direction of the turn, the right hand for a right-hander, left hand for a left-hander. The opposite palm remains stationary. We relocate the 'inside' hand against the direction of the turn, depending on how tight it is. For most cars, a tight hairpin can be negotiated within a turn of 130 degrees of the wheel (one-third of a turn of lock) and a typical right-hanger in the public can be negotiated in a reasonable speed with 180 degrees of turning the wheel. The end of the steering lock is achieved within 540 degrees (or 1.5 turns of the wheel). At our 'turn-in' point, we begin to pull the wheel into the corner while letting the rim slip controllably under the opposite palm. At the end of the turning motion, our hand should return to it's position at either 9 or 3 accordingly, so that we are again at the basic position with the front wheels turned into the corner. We keep the hands in this position, in readiness to perform further corrections with fixed-input, and as we reach the apex we relocate the opposite hand to pull the wheel back to straight, rather than allowing it to run back freely or turning it back with the opposite hand. We turn-in with one hand and track out with the other. 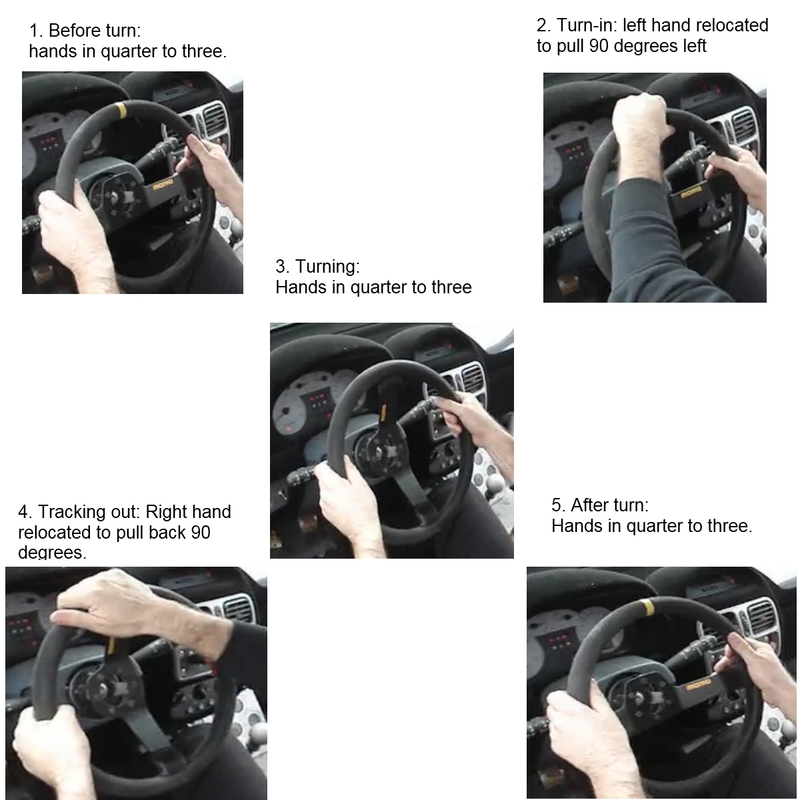 The advantages of this technique begins with the ability to turn the steering wheel very significantly in a single, smooth hand motion. Only in this way can the steering we turned securely (so it won't run free from our hands) and just at the right pace: Smooth enough to prevent any jerking of the chassis and suspension, but decisive enough to allow the car to "take a set" over the outside suspension. The leverage with this technique is enough to turn the wheel a full turn of 360 degrees with a single hand motion, and return to the 9 to 3 position which allows to turn it a further 260 degrees in each direction. Successive hand motions can be used to turn the wheel rapidly to the end of the lock, or from lock to lock. A secondary advantage is obviously maintaining the proper hand position for the longest time possible: Before the turn, in the turn and coming out of the turn. Even during the transients, where one hand is relocated or is turning the wheel, the opposite hand remains in the correct positioning. It provides additional feel and a crucial "balance" to the other hand. If we were to turn the wheel one-handed, the weight of the steering hand would interfere with our attempts at achieving precise steering, by acting as a weight that would pull the wheel down, forcing us to use our upper body to cancel out it's effect. By this way of turning, we ensure that we always have both hands on the wheel, and at least one hand that is gripping and guiding it. We are always in a position of readiness to cease the steering input, remove it or even turn the wheel in the opposite direction. A third advantage is that the pulling hand provides increased sensitivity relative to the pushing arm. Pulling the wheel is done by utilizing almost all of the muscles of the arm itself, notably the smaller muscles of the forearm, that operate the fingers. This provides good feel, smooth and precise turning and less effort in turning the wheel. Pushing the wheel is done with the upper body and big, strong muscles like the deltoids and cuff rotators, which provide little sensitivity and excessive effort for the task of steering. 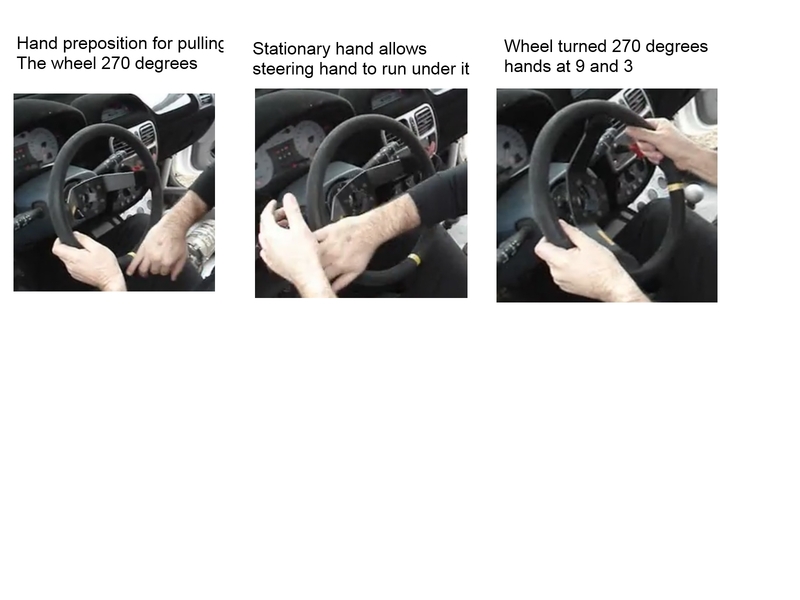 It is true that when pulling down, the wrist twists in a way that slightly impairs smooth steering, but in this technique the idea is to pull the wheel from across, rather than from the basic position and downward. One last advantage is that this manner of turning is symmetrical. Within the outset of demanding driving on a rally stage, race or even a drive around a winding mountain road, the arms will face roughly identical loads and the turn-in and track-out phases will mirror each other out. It also means that the other advantages mentioned above will be maintained during the steering motion and the retracting motion. This method also allows to turn the wheel one-handed, if required. This was crucial for rally drivers which at the time were also occupied with constant gear changes and an occasional use of the handbrake to turn the car. "A good steering style results in effective driving, a quick and percise response from the car to the steering input and less driver's fatigue while driving. By acting upon the described style you will find out about a new world of easy driving and a disciplined car. Amongst other things, you will become aware of the fact that thus far you have turned the wheel too much and with excessive effort. I will now discuss how to turn the wheel effectivelly while performing significantly less hand movements. Afterwards, you will learn to apply more steering in less effort and time. During a demonstration in my race car to the public, one of the common responses was: "How come the car turns so much, with so little an input from the wheel?".. The pulling hand goes on top of the wheel (12 O'Clock), pulls down to 9 or 3, when the other hand stays stationary. Sometimes it's beneficial to remain in fixed-input for this amount of steering-lock and sometimes -- when the corner is long -- this technique is prefereed. For the same reason, relocating both hands before the corner (see "dual-movement steering") is not recommended here. Using the dual-movement method here will only result in more effort and a difficulty in retracting the wheel. In older cars with a greater steering ratio, or in road cars, the pulling hand goes across the wheel, just over the other hand. This is not going to be a full 180 degrees, so you might want to hook the thumb of the pulling hand under the spore of the wheel and pull with it, to reach a full 180 degrees of leverage. Now, streach your arms to make sure your wrist stays firm as you make corrections with both arms. Now, take the other hand and do the exact same drill, in reverse. Pulling is done quite quickly, while pulling back is done gently. The pulling hand goes to 6 O'Clock (bottom of the wheel). The idea is to hold the hand with the palm pointing up, hand upside down, gripping the rim firmly. It becomes comfortable with the right posture and once you get used to it. Now, pull all the way across the steering wheel, under the stationary hand (momentarily lift it) and back to 9 or 3. Pulling is done almost sharply turning in, and gently coming out. The stationary hand should not be ubruptly lifted off of the wheel, it should simply let the steering and the pulling hand go just under it, so you are not really steering one handed. Once you acquire the skill of it, this movement can be refined, so you first turn the wheel a 90 degrees with both hands and than pull it the extra 180 degrees. This is good for when you need to make a succession of such movements, like when you need to reach the far right or left lock of the wheel, or even turn it from lock to lock. With skill, it can become very quick. The best method is simply to relocate the hand to pull the wheel a full 270 degrees, but keep pulling down towards the bottom of the wheel (6 O'Clock). This reduces the sensitivity while turning and the time in which the hands remain in the 9 to 3 position, but it maintains the prime goal of achieving maximum leverage in a minimum of hand motions. In the event of successive cornering, this method can be used to pull the wheel in great movements to overlap the initial turn-in without retracting the wheel between rapid corners. You can, for an example, steer 180 degrees right and than pull 270 degrees to turn a 90-degrees left, and than relocate the right hand to 12 O'Clock to take off the lock and back to 09:15. This way, only three hand movements are used to steer the car through two successive corners, with the hands kept most of the time at the correct basic stature. In any other technique, this maneuver would require much more hand movements, and would have been much less accurate. It's important to acknowledge the extremities of steering technique, or situations where the steering technique above should not be followed as religiously. For instance, what happens when you need to turn the wheel quickly and sharply? For most purposes, the recommended approach will do, but sometimes it's just not quick enough. The excepted technique for this situation is hand-over-hand. Let's use the example of turning right: You grip the wheel at quarter to three, push it across with the left arm a full 180 degrees, cross the opposite arm over and pull it to a full 360 degrees. Your hand fall back to quarter to three from where you can turn with "fixed input" to the far end of the rack. To quickly reach the opposite lock, you straighten the hands, perform two "hand-over-hand" cycles and cross your arms again. There are, of course, other methods used to turn the wheel. These method are not recommended, because they usually involve successive and rapid motions (instead of one fluid motion), or use the brute strength muscles of the shoulder used when pushing the wheel along. Hand-over-hand steering, the most intuitive manner of steering, but generally speaking - the least efficient one either (with the exception of turning the wheel one-handed with the palm). Can be quick if used in large enough steering motions, but is likely to make for steering that is less smooth and accurate than desired, split into too many hand movements and operated with excessive effort due to the use of upper body strength, and maybe result in the wheel breaking loose from the grip of the hands or the hands getting entangled. Another kind of rotational style is taught by some advanced driving schools nowadays, as in BMW and Audi, and involves gripping the wheel at quarter to three, initiating a steering motion that begins as fixed input and is than followed by crossing the arms. Another style that can be observed is where some people, mostly women with feeble arms, will perform this while gripping the wheel from the inside. This grip rotates the arm as to limit the shoulder cuff-rotators so that the driver cannot turn the wheel further into the turn, or against it. It also causes the driver to bend the wrist and use upper body strength again. It can also result in fracture to the arm, should the rim be jerked by an obstruction on the road surface. Another basic steering style that has been refined by some institutions, mainly in the UK, into a technique that is conventionally known as "push pull." This technique tends to be smoother and more secure, but less quick and quite awkward for large or quick inputs. It again splits the steering motion into smaller movements than possible, and relies in part on pushing the wheel from across. When holding and turning the wheel with one hand, and the other hand not in contact with the wheel, we lose important advantages: We load the forces unto the muscles of a single arm and shoulder, rather than divide it equally between two. We loose the balance that the opposite hand forms, so that the weight of the one arm, even when the wheel is held static, works as a weight that tries to turn the wheel in one way, a turn we have to resist to by use of our upper body. We are also forced to use these brute strength muscles to push the wheel (if we grip the wheel with the right hand and have to turn right, for instance), especially in the custom grip where drivers hook their one hand inside the wheel at 6 O'Clock. Like the steering technique we advocate, some drivers predict the bend ahead and relocate both hands instead of one. The advantage is the use of both hands simultaneously when turning into the corner, but there are many disadvantages to it: We either have to reposition both hands simultaneously and let go of the wheel, or one by one so that we don't maintain the quarter to three position for as long as we need before the bend. The limitations of the leverage of both arms is such that makes this technique efficient with a tight range where it is more beneficial to turn the wheel with fixed-input to begin with, making it useless. Also, we move both hands offset, rather than have at least one in the right position. Another problem arouses when we need to retract the lock, or in successive turns, because we cannot relocate both arms again at the apex, and we are forced to return the wheel to straight by 'winding' it off to straight by shuffling the hands or by turning it with both hands and than bringing them back to quarter to three, so we either compromise the symmetry between the hands or the amount of time during which the hands are at the right position. This is a method involving moving the hand in the direction of the corner untill it's just above the other hand. Than, push with both hands like a "handlebar", enabling about 220 degrees of rotation. The point of this technique being, that pulling down creates a bend in the wrist, thus disabling smoothness and control. However, there are other ways to manage the wheel without twisting the wrist, which do not include pushing, which is an action based entirely on muscle shoulders, which have brute strength and very little sensitivity. Also, this turning style, does not enable much leverage, and therefore has a very limited use, as it can't be used for the smaller curves, or the tight hairpins. Once the wheel is turned, the ability to control understeer or oversteer is minimal. Read here for more on this technique. The article claims that wrist flexation causes a lost of sensitivity, which again results first and foremost from the false assumption that steering is a physical toil (based on the days of old heavy steering wheels) that requires strong muscles and repetitive hand movemnets to be applied. When the same author talks about pedal operation and shifting, it is intersting to see that he suddenly referrs to a more gentle movement, that originates ( in the event of shifting down) from the wrist. Additionally, the author specifically referrs to "pulling down towards 6O'Clock" I.E. Shuffle steering, which also explains his preference of a hand-over-hand operation for U-Turns. In the technique we suggest, the pulling hand never goes below the diameter of the wheel, hence this flexation does not occur (the wrist movement that does occur is completly different in a physiological plain). Additionally, the world of motorsport relies greatly upon tradition from eariler racers. That is, you pull on the wheel because I told you my instruct told me so as a student that his instructor told him so, tradition at it's best! The author did not supply any such example of any other racer or racing school promoting this method (even though one oculd easliy find some), while we have supplied evidence from several places ( the videos). The rational behind the technique is not nessecarily a better arguement than the simple fact that a reliable source or instructor told you so. Just like you can tell nonesense, you can make up an obscure logic behind an irrational technique. The fact remains that the majority of race schools tend to this method, and that people have been found to be smoother by pulling. Even if a certain persons finds (or "feels") that pushing works better for him, does not make it a techniqe. "By the way, I have a question about your comment: "Push with your hand instead of Pulling. for example right turn = push with left hand." I'm confused because I noticed myself over-correcting all the time if I rely too much on my outside hand to push the steering wheel to the direction of turning! An experienced go-kart driver told me to do the opposite of what you recommend, I tried his way of relying more on the inner hand to pull the steering wheel to the direction of turning and I found out I have a much smoother turn in and less correction needed!! However, from a point of reason, the question of whether the disscussed pushing movement will be more sensitive is greatly irrelevant, as the net result is poor leverage and a very awkward hand position in the corner, unlike in a pulling movement, where a correct grip is constantly kept and the steering application and unwinding are symetrical in terms of the applied hand movement. If pushing is so critical to smoothness, why does the author suggestes that the wheel be winded back in a pulling motion, completly different from the hand movement used when turning in? And what if a change in the turning angle or countersteering is required somewhere in the corner? Additionally, the article promots using this pushing style only in a very limited number of corners, as most corners are driven with both hands and sharp switch-backs are made hand-over-hand, not to mention that modern race cars do not need such big steering inputs as they do not need an application of scuh strong muscles. The very notion, that it is better ot prefer crossed forearms or repetitive hand movements over this method whenever possible, illustrates how impractical this technique is. Furthermore, the yet to-be explained point about wrist movement would suggest that the author did not even consider that the driver might cross his hand over, neither distinguish between smooth turning of the wheel and sensitive grip of it when static. The techniques desribed are the most basic and refers to fixed-input, rotational and shuffle-steering, as well as this awkward steering style, which was taught in a different variation at BMW's at the late 80's, under the assumptions that drivers turn too slowely to avoid obstacles and that the steering rims of the time required more torque to be applied against them. The method was quickely abandoned. The probelm with extensive wrist flexation is the narrowing of the carpal tunnel hosting the median nerve which runs to the heel of the thumb. The problem again relates either to extensive wrist movement when the driver pulls down all the way towards the bottom of the wheel, or when the wheel is gripping for long durations of time this way, rather than turned this way in a corner. Even if the above carries truth, than it is overcompensated by the better use of the motor units of the hand and aided by the fact that the opposite wrist remains put and in a position to aid or correct the input, or recieve feedback. Additionally, the notion of pushing can be fed from the wrong assertions of the article that (a) The palms are the main sensory input, (b) Force is ought to be applied against outside diameter of the rim; (c) That the range of motion of both hands in 9 and 3 is 190 degrees (Rather, it is about 250 degrees, making the suggested technique redundant). This page was last modified on 3 September 2011, at 20:12. This page has been accessed 32,507 times.